Here we are, halfway through the school year, and this is where things in the food department tend to grind to a crawl- if not an all out halt. I don’t know about you and yours, but in my house weekday breakfasts and lunches are getting to be an unpleasant chore. I ask the kids what they want and the answer is usually the same: “I don’t know”. What started out with good intentions of fresh, homemade meals somehow devolved into cold cereal and the same sandwich every single day. Frankly, I’m as sick of dishing it as the kids are of eating it. So I did what I always do: I hit up my recipe sites and cookbooks. What I found was a small stash of good ideas that I can integrate into our food routine and at least get through the rest of the school year. This recipe for breakfast oat bars is one of the little nuggets of delishness I found. The original recipe called for bananas as the fruit. I’ve found that I can use not only bananas, but also applesauce (homemade works like magic! ), or pumpkin. This batch is a mixture of applesauce and banana and it’s fantastic! These bars are also super cheap to make since they use basic ingredients. If you’re like me and buy in bulk, the cost is even less still. I double the recipe to fill a 13×9 inch pan because there’s 6 of us in our house currently, so making a single batch would be kind of pointless. All you need is oats, flour, an egg, baking soda, salt, fruit puree, oil, and vanilla. You can also add in a few other fun things like nuts, chocolate chips (whichever flavor strikes your fancy), cinnamon chips, caramel bits… whatever you like! Just don’t go overboard; the bars won’t hold together if you add too much of your mix-ins. Combine the dry ingredients and wet ingredients in separate bowls, mix it all together, put it in the pan, and bake. That’s it! You could even make this first thing in the morning, bake it while the kids are getting ready, and give them a serving fresh out of the oven for breakfast. To be honest, I have no idea how long these bars will last in a container; they’re gone within 2 days and I have to make a new batch. They’re just that good! *Spray an 8×8 inch baking pan with cooking spray or line with foil and then spray the pan. *Combine all dry ingredients in a medium sized mixing bowl. *Whisk the fruit in with the other wet ingredients and add to the dry mixture. *Mix until all the dry ingredients are incorporated, then spread into the prepared baking dish. *Bake 18-22 minutes, or until the middle is set and a toothpick comes out clean when inserted. *Cool in the pan for 10 minutes, then transfer to a cooling rack until completely cooled. If aluminum foil was not used, slide a knife around the outer edges of the bars, invert the baking pan onto cooling rack, and let gravity do its job. Then remove the pan and let the bars cool completely. “What on Earth is in the blue bowl? ?” you ask? Well… my kids still don’t care for pieces of onion in their food, so I grate the onion I need on the fine holes of my box grater. That’s what’s in the blue bowl. Now is the time to get a skillet out and and put some olive oil into it- about a tablespoon or two, just enough to cover the bottom of the pan. Set the heat to medium and once the oil shimmers, add in the carrots and onions. Cook for 2-3 minutes, stirring frequently, until the onions are fragrant and beginning to go translucent. Add in the garlic and cook for another minute. Take the pan off the heat and set it aside. I have never used this particular bread before (from the bakery of a grocery store I shop at), so I didn’t know how it would react to the milk. Turns out, I had to double the milk and rip it into pieces to get it properly soaked. But that’s ok; you can just add some crackers later. Make sure both the baking pan and the plate you’re working with are either sprayed with cooking spray or brushed with oil very well; that’s the only way you’re going to get the meatloaf to slide out of and then back into the pan and not have it stick to the plate either. Use thick cut bacon bacon that’s long enough to line your pan. I use Farmland thick cut bacon and it’s a perfect fit. I tried Oscar Meyer bacon once because it was on sale and it was WAY too short- and I got the regular bacon, not the center cut. I couldn’t use it at all for this meatloaf. When lining the pan, stretch each piece of bacon gently to lengthen it just a little so that when it shrinks while it’s cooking (which is inevitable) it continues to surround the meat mixture. Also, place the bacon strips so that you have the wide and narrow ends alternating; you’ll get better coverage that way. Here’s the “hard” part. It’s not technically difficult, you just have to be careful (but quick) and confident. You can’t stop in the middle or lose your nerve at the last second. Gently ease both hands under the meatloaf, supporting the length on both sides. Pick the whole thing up and carefully set it down in the same pan you used to wrap the meatloaf to begin with. This is going to take awhile to bake, so don’t try to make this on a busy weeknight when you only have a little bit of time to cook. It makes amazing leftovers, though, so you could certainly bake this meatloaf on the weekend and reheat it during the week. I usually bake this recipe for over an hour. The bacon will be thoroughly cooked and a thermometer stuck into the center will read 165F-170F. Once the pan comes out of the oven, tent it with foil and let the meatloaf rest for 15-20 minutes- and please don’t skip this step! The mixture is very tender and needs some time out of the oven to set properly. Cut slices with a serrated knife and serve with whatever you fancy. After your main meal you can refrigerate the leftovers (if there are any), slice them whatever width you like, and makes sandwiches on some nice, soft bread. Mmmmm…. meatloaf sandwiches…. *In a frying pan, melt the fat over medium heat. *Add the onions and carrots and cook until the onions are soft, stirring frequently. *Add the garlic and cook another minute then put the pan aside to cool for at least 5 minutes. *In the meantime, put the slices of bread into a bowl large enough to hold all the ingredients (except the bacon, of course), sprinkle the brown sugar over it, and pour the milk over it all. Let it sit until the milk is absorbed. *Add the ground beef, veggies, eggs, herbs, spices, sauces, and crackers (if using), and mix thoroughly. Your hands work best for this! *Cover the mixture and let it rest in the fridge for at least an hour, but not more than 8 hours. *Spray a 9 inch bread pan (I prefer glass) with cooking spray or brush with oil. *Line the pan with bacon, leaving the tips hanging over both sides. *Put the meatloaf mixture into the pan and fold the bacon over the top. *Spray or oil a platter and put it over the loaf pan. Flip them both over and set on the counter to let the meatloaf fall onto the platter. *Remove the loaf pan and carefully put the meatloaf back in, bacon tips down. *Bake 1 hour or until a thermometer inserted into the center reads 165F-170F. *REST THE MEATLOAF FOR AT LEAST 15 MINUTES! *Gently slide a spatula under each end of the loaf, remove it from the pan, and place on a serving platter to slice. The ingredients for this casserole are pretty straightforward. If you don’t have any tomato paste on hand you can use ketchup, but don’t skip it completely. I used to because I couldn’t fathom using tomato anything in gravy. I was sorely mistaken! Even the small amount that’s called for in this recipe adds a layer of flavor and richness that will be lacking if you leave it out. There will be a flat note in an otherwise beautiful composition. And it doesn’t taste of tomato at all, so don’t worry about that. Start by preheating your oven to 425 degrees so it’s waiting for you. Then get out a skillet or frying pan that is big enough for all of your filling ingredients plus the 4 cups of gravy. So you need a BIG one. Heat the olive oil or bacon fat (adds a touch of smokiness that is awesome!) over medium high heat. Put the chicken in the pan and cook until it’s no longer pink. Add in the ham and carrots and cook them all together until the chicken browns, about 5 minutes. Transfer those to a bowl and set aside, then lower the heat to medium. In the same pan, melt the butter and cook the onions until they’re soft. Add in the garlic and tomato paste and cook for another 2 minutes. Sprinkle the flour over the mixture and stir to incorporate. Congratulations, you’ve just made a roux! Let the roux cook for about 3 minutes, stirring often, to get rid of the raw flour taste. Break out your whisk and add the chicken broth and milk to the roux. Whisk while you’re adding the liquids so you don’t end up with huge lumps of roux. Once all of the liquid is in the pan, whisk until there are no lumps except onions and garlic. Now you can add the meats and carrots back into the pan. Add the Worcestershire sauce, parsley, and peas and bring to a boil. Taste the filling to check for seasoning. Add salt and white pepper to taste. You CAN use black pepper, but I prefer the flavor of white pepper and it eliminates having black specks in a light colored sauce. Once you have the filling seasoned to your liking, start on the topping. I usually get the dry ingredients put together while the chicken is cooking. If you didn’t, that’s fine too- just do it now. The filling can sit for a little while. Once you have your dry ingredients mixed (including the Parmesan cheese), grate your butter into them. I just stick the box grater at an angle in the bowl to save on dishes. See how nice and small those pieces of butter are? They make it SO MUCH easier to incorporate into the flour! I do this just about every time I have to incorporate cold butter into flour. You could cube the butter and work it in, but why?? So evenly (and easily) mixed! Yay! Add the milk and stir to make a sticky biscuit dough. This isn’t the type of biscuit dough that you can roll out and have pretty biscuits for sandwiches. This will form a craggy topping of biscuits (looking not unlike the topping of apple crumble dessert, hence the name) that are perfect for eating with stew. Spread the chicken filling evenly into a 13 x 9 baking dish and drop the biscuit dough in gobs of about 2 tablespoons (I’m totally guessing!) all over the top. I usually get about 12 gobs (technical term) out of this batch of dough. Bake this in your preheated oven, uncovered, for about half an hour. You want the filling to boil for about 10 minutes and the topping to be nice and browned. If your topping gets too brown before the filling boils, turn your oven down to 400 degrees and cover the dish with foil. You may also want to get your oven calibrated, or at least get an oven thermometer so you can make sure it’s at the right temperature. Once the filling boils you can take the foil off and finish the dish. Just don’t let the topping burn. *Preheat your oven to 425 degrees F.
*In a large skillet, heat the bacon fat or oil over medium high heat and brown the chicken, adding the ham and carrots about halfway through. *While the chicken is cooking, combine the dry topping ingredients, including the cheese. *Grate the butter either directly into the bowl or onto a chilled plate (if using a box grater; a chilled bowl will work for using a flat grater). *Gently mix the butter into the dry ingredients. Set aside in the fridge. *Once the chicken is brown, transfer the mixture to a large bowl and set aside. *In the same pan, lower the temperature to medium and melt 6 T butter in the same pan. *Cook the onions until they’re soft, about 5 minutes. Add in the garlic and tomato paste and cook for another 2 minutes. *Sprinkle the flour over the mixture and stir well. Cook the roux, stirring every minute or so, for about 3 minutes to get rid of the raw flour taste. *Whisk in the chicken broth until no lumps remain, then add the milk. Whisk together to ensure there are no lumps. *Add in the Parsley, Worcestershire sauce, peas, and the chicken & veggie mixture. Bring to a full boil, stirring occasionally. *Turn off the heat and check for seasoning, adding salt and pepper to taste. *Retrieve the bowl of biscuit ingredients from the fridge and pour the milk over the mixture, stirring gently until incorporated. Get the biscuits well mixed, but don’t over work the dough or the topping will be tough. *Coat a 13 x 9 baking dish lightly with butter or spray with cooking spray and then pour the filling into it. *Drop the biscuit mixture evenly over the filling in 2 T gobs until you’ve used it all. *Bake, uncovered, for about 30 minutes or until the filling is bubbly and the biscuits are a deep golden brown. If the biscuits brown too quickly and the filling isn’t boiling yet, cover the pan with foil or an inverted baking sheet and lower the oven temperature to 400 degrees. Now, the original recipe that this idea came from had a whole convoluted list of steps- most of them unnecessary. I’m not sure if the lady was just trying to make it sound like she was positively slaving away over the pie to get a pat on the back or if she really, truly thought that making a pie had to be that difficult. People tend to think that pie making is complicated, but it really isn’t. In fact, a pie is one of the very simplest things to bake. There’s no raising of dough or tiptoeing around the house because you don’t want what’s in the oven to fall. You make the filling, make the crust if you don’t want to buy one (another process that’s touted as difficult, but that’s another post), put the former into the latter, and bake until done. So, while this particular recipe has a couple of extra steps compared to a “regular” apple pie, I’ve simplified this process to be as easy as it can get. In that vein, let’s get started! But I totally cheated with the slicing part. I’ve wanted a food processor for YEARS. As in, since I left home at 19. I’m 36 as of this writing. So when I found an insanely wonderful deal on the food processor I’ve wanted since I first saw it, I went to my husband and asked pretty please. Being the wonderful man and biggest fan of my food that he is, he said yes! So today, for the first time, I used my beautiful, brand new Kitchenaid food processor! So now that the apples are sliced and ready, the hardest part of making the filling is over! Drain the apples well and put the whole batch into a frying pan or pot big enough to hold them along with the butter, sugar, and spices. Cook them until they are just beginning to soften. You want them to have plenty of crunch left, but they should be partially cooked. Once the apples are cooked enough, turn off the heat and take them out of the pan with a slotted spoon. Make sure you drain as much of the liquid off of them as you can. Put the apples slices into a colander over a bowl (or, in my case, the pasta insert that goes into my stock pot) and set it aside while we deal with the leavings in the pan. We’re going to cook this down into what amounts to caramel. Don’t panic; this step is very easy, it just takes some time. Turn the burner back on and bring the apple liquid to a fast boil. Give this a stir every couple of minutes and continue to cook at a fast boil until the liquid begins to thicken. Check the bowl that the apples are over a couple of times to add any more collected liquid into the pan. Thickening the liquid can take upwards of 8-10 minutes. Just keep an eye on it. At this point you should stay with the pan, stirring continuously. Lower the heat a bit so that you get a steady boil instead of a fast boil. You’re looking for larger bubbles that are a little slower to pop. Keep cooking and stirring until you end up with the consistency of the caramel topping you would put over ice cream. Cornstarch to the rescue! Once the apples are at room temperature, sprinkle them with 3-4 tablespooons of cornstarch. Stir the apples well to mix the cornstarch into the liquid and you’re set! The sauce will be very cloudy, but that will clear up once it’s cooked. Do not, I repeat: DO NOT try to add the cornstarch while the apples are hot!! Anyone who has tried to make gravy by adding cornstarch directly to the hot drippings and broth can tell you that doing so will only end in gluey lumps of cornstarch. So do yourself a favor and wait until the apples are cooled to add the cornstarch. Before the pie is assembled, mix up the egg wash. This is what you’ll brush over the top of the pie to give it that nice, shiny top crust that you find in restaurants. You can mix the egg with a tablespoon of water, but using heavy cream instead will give you a slightly thicker, and much richer wash. Take my advice: use the cream. Mix the cream and the egg VERY well; you don’t want streaks of egg white on top of your pie. Now put your bottom crust in your pie pan and add the apples to it. I like to mound them slightly in the middle; it gives the pie a very classic shape and, since the apples are already cooked, you don’t have to worry about them getting cooked all the way through or the apples shrinking as the pie bakes, leaving a disappointing hollow cavern under the crust. Take your top crust and put it over the pie pan, crimping the edges to seal the top and bottom crust together. I do a simple roll under and crimp, but if you want to do something fancier, have at it. The pie will be all the more impressive for it! The next step is to brush on the egg wash. You don’t want it pooling all over the place, but do brush the egg wash on with a fairly heavy hand. With a sharp knife, cut some vents into the top. You could cut shapes, but I stick with simple, classic slits. Just make sure you vent the pie somehow, or the top crust won’t survive and the steam won’t be able to escape and you’ll have runny filling. Wrap the edges of the pie with aluminum foil or put a pie shield on it and into the oven it goes at 400 degrees. My pies usually take a total of 70-80 minutes, but that will vary by oven. After the first 40 minutes, check the pie. It should still be fairly light but beginning to brown. Go ahead and uncover the edges and continue baking it. At the one hour mark check it again. It should be browning well now and you should be getting a little bit of bubbling from the filling. For the pie to be done, it needs to be uniformly browned and the filling needs to boil for at least 10 minutes. Isn’t that a beautiful color?! That deep, rich, glossy color comes from the egg wash. The crust would be dull and pale without it- not unlike the pre-egg wash photo above. My crust buckled a bit, though, and I can tell you why: I made the mistake of making the top crust too tight. I know; it sounds funny, but it’s true. I didn’t make sure the middle had enough dough before crimping the outside. I should have laid my crust over the top, run my hands over the mound in the middle, and then crimped the edge. The crust shrank as it baked (naturally), so it separated. It really doesn’t matter though; I’m not entering it into a beauty contest and the taste far outweighs any homeliness the pie may posses! *Fill a very large bowl about halfway with cold water. Add the juice of half a lemon, lime, or orange. OR add 1 T Apple Cider Vinegar. *Peel, core, and slice the apples to about 1/8 inch, keeping them in the water as much as possible to prevent rusting. *In a pot or frying pan large enough to hold the apples, melt the butter over medium high heat. *Add the apples, sugars, and spices and cook, covered, for about 10 minutes. The apples should be starting to cook through but still have plenty of crunch. *Remove the apples with a slotted spoon to a colander or other strainer set over a bowl. *Bring the liquid from the apples to a fast boil and hold it there, periodically adding any accumulated liquid from the bowl under the strainer. *Once the liquid begins to thicken, lower the heat until you get a moderate boil; the bubbles should be a bit larger and pop more slowly than before. Hold this boil until the sauce has reduced to the consistency of the caramel sauce that goes over ice cream. *Shut the burner off at this point and add the vanilla and the 1/4 C of heavy cream. *Turn the burner back onto medium low and boil the caramel until it is once again thickened as in the last step. *Take the pan off the heat and stir in the apples. *Cool the mixture to room temperature. This may take a couple of hours. *Sprinkle cornstarch over the filling and mix well to incorporate. *Whisk the egg and 1 T heavy cream very well and set aside. *Prepare a 10 inch common depth or 9 inch deep dish pie plate with a bottom crust. *Pour the filling in and place the top crust over it, making sure to secure it (run your hands over it to smooth it) from the middle outwards before crimping the edges. Make sure the edges are sealed. *Brush the egg wash over the entire top of the pie. Don’t skimp on this step. *Cut steam vents into the top crust. *Wrap the outer edge of the pie plate with foil (make sure it doesn’t rest on the crust) or cover with a pie shield. *Bake the pie until beginning to brown. *Remove the foil or shield. *Bake until uniformly brown and the filling has bubbled for at least 10 minutes. May take 70-80 minutes total bake time. I’m not really one for food fads. I was tired of the make-every-food-rainbow-colored fad in super short order, the macaron fad got boring pretty quickly, and if I see one more carb dish “made over” with cauliflower (yuck!) I swear I’ll scream. However, I have to say that I am totally on board with the pumpkin trend. Every year I look forward to pumpkin season. Not because I can finally have pumpkin flavored things, because I make those year round. No; I look forward to it because canned pumpkin gets cheaper and I can stock my pantry for the year. And, now that I have my own basement with my own pantry shelves, I plan to go a little stock up crazy. It’s already begun; I have eight 15 ounce cans and three 29 ounce cans of pumpkin on my shelves. And these pancakes are a prefect way to use some of them up! Basically, all you’re doing is mashing the recipes for pancakes and pumpkin pie together! So combine all of your wet ingredients, including the pumpkin. Oh! I’m hoping that by now you know that you should NEVER crack eggs on the side of a bowl, dish, or pan. Not only can it make a mess, but you’re almost guaranteed to end up with shell in your finished product, and when you bash the shell into the inside of the egg you’re also introducing any bacteria or debris that was on the outside of the egg into the inside- of the egg and then of you! So please; ALWAYS crack your eggs on the counter or another flat surface and pry them apart to empty them. *Melt the butter in a small saucepan over low heat or in the microwave. Set aside to cool a bit while you see to the other wet ingredients. *Combine the buttermilk, pumpkin, eggs, and butter in a small bowl. Stir until completely mixed. *In a very large bowl, combine the dry ingredients until mixed completely. Make a well in the middle. *Pour the wet ingredients into the well in the middle of the dry and mix until well blended but not completely smooth (that would overwork the batter). *Heat an electric griddle to 325 degrees or a pan or stove top griddle over medium heat. *Drop the batter by 1/3 cup measures (or 1/4 C for smaller cakes, or 1 T for mini cakes) onto the griddle and cook for about 3 minutes. *Flip the pancakes over and cook another 3-4 minutes or until a deep golden brown. *Remove the finished pancakes to a platter and continue until you run out of batter. *Serve immediately or cool completely and freeze in an airtight container or zip top bag for up to 2 months. I think most of us know that every region of America has it’s own “signature” dish. Texas has barbecue, New England has clam chowder, California has Mexican in the South and wine country in the north, and the Mid West has fried foods and roasted corn. But how many of you know about the “signature” dishes of the far Northern part of our country? Before I moved to South Dakota I had no clue at all. But I learned quick! South Dakota has chislic: small bites of marinated beef, lamb, or venison, grilled or fried and served with toothpicks and hot sauce to dash on each piece. It was on EVERY menu that didn’t belong to a national chain restaurant and everyone thought theirs was the best, naturally. Minnesota, being heavily Scandinavian, is big on lutefisk (pickled white fish) and other northern European treats. And, of course, Wisconsin has it’s cheese; specifically, fried cheddar cheese curds. But there’s also a wider ranging dish that is ubiquitous throughout the eastern Dakotas, northern Minnesota, and northern Wisconsin: Hot Dish. Much like any other regional dish you’ll find, every person who makes it has their own rendition of it, all are a favorite of someone, and everyone thinks theirs is the best. 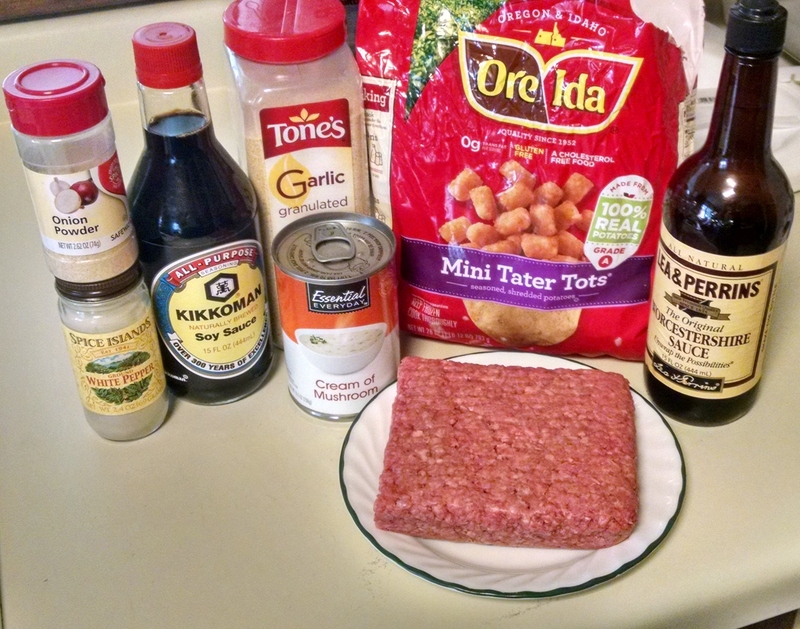 The ingredients have surprising variation; some people use ground meat, some use cubed. 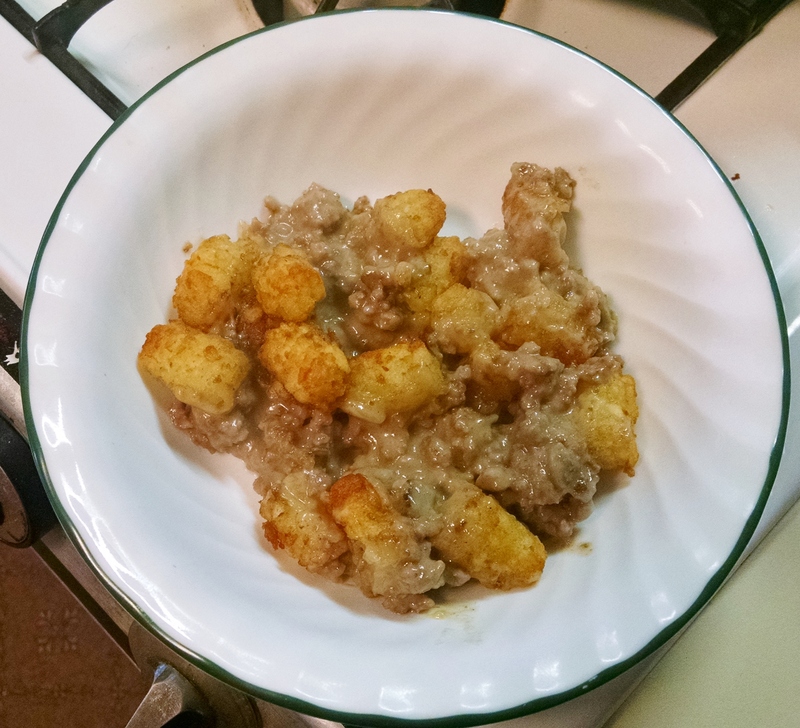 Some use mashed potatoes on top, many use tater tots, and some even use white or wild rice in their hot dish and forgo the potatoes all together. But they are all known as hot dish because they all consist of meat in some sort of sauce, possibly with veggies mixed in, with some manner of starch, and without fail the dish is in casserole form. It shows up at every single pot luck function in at least one iteration because it’s expected to; it’s not a pot luck if there isn’t hot dish. Being short on time and ingredients one afternoon, I set out to make my own version. I got the basics together and just started adding things as the ideas came to me. I do that a lot. We were pleasantly surprised with the results and it’s a regular feature in the cold weather menu rotation. Thankfully, I was able to remember what I put in the pan! Yes; that’s canned cream of mushroom soup. This is a super easy dish that is very budget friendly. If you want to make condensed cream of mushroom from scratch, it will work really well in this recipe and the taste will be phenomenal. But for now, canned is fine. So brown your ground beef, drain it well, and put it back into the pan you used to cook it. Add the white pepper, onion & garlic powders, the soy & Worcestershire sauces, then the soup. Stir everything together and see what you’ve got. It will be super thick, so we want to thin it out a bit. How much varies; add milk or water until the mixture is the consistency of a stew. I usually end up adding about 1/3 cup of milk but sometimes it’s a little more. Once you have the right consistency, heat the mixture to a boil and then transfer it to an 8×8 baking dish. Since I have all stainless steel cookware (which means it’s oven safe) I just spread the mixture evenly in the same pan. 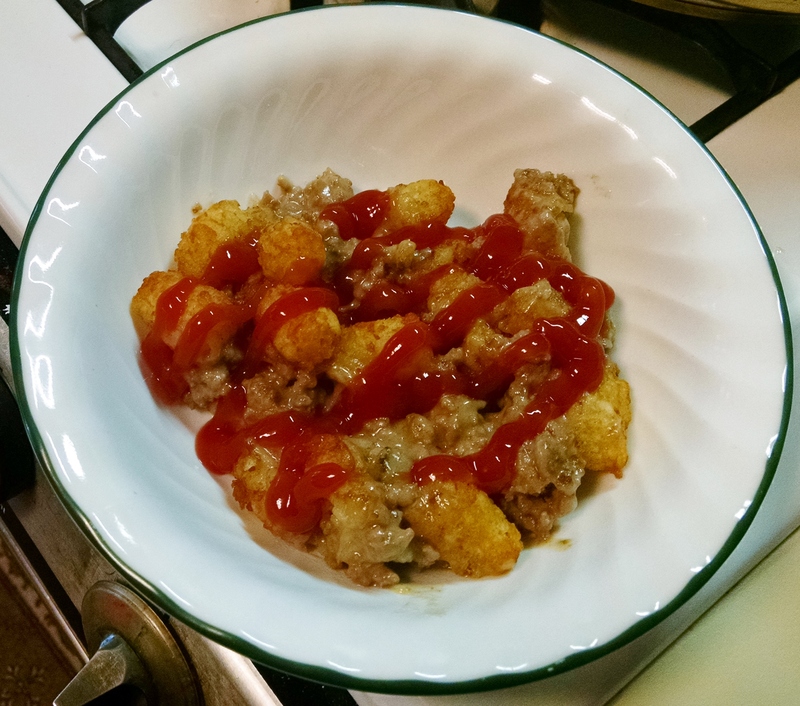 Now you can spread the tater tots over the top of the beef mixture. I prefer to use mini tater tots, but use whatever you like or can find. Ready for the oven! Put the dish or pan in the oven, uncovered, at 400 degrees until the tater tots are golden brown and crispy on top. Usually that takes about 30 minutes in my oven. See how the sauce bubbled up between the tots? That’s how you know it’s cooking properly. If your tots are brown and crispy but the sauce isn’t bubbling, the dish is cooking too fast. Cover it with foil, cook until bubbly, then you can take the foil off and crisp up the tater tots. *Heat the oven to 400 degrees. *In a medium skillet or high sided oven safe pan, brown the ground meat then drain it well. *Put the meat back into the pan and add the rest of the ingredients EXCEPT the milk and the tater tots. *Mix very well and add milk or water until a stew-like consistency is reached. *Heat the mixture to boiling then transfer it to an 8×8 baking dish (unless you are using an oven safe pan or skillet- then you can leave it where it is). 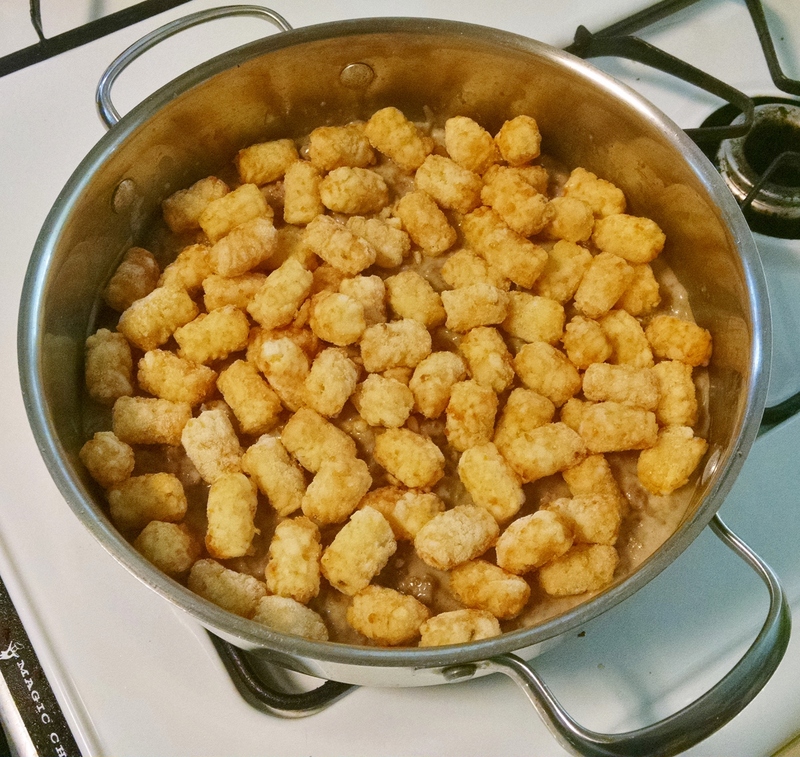 *Layer the tater tots over the mixture evenly, making sure there are no large gaps. 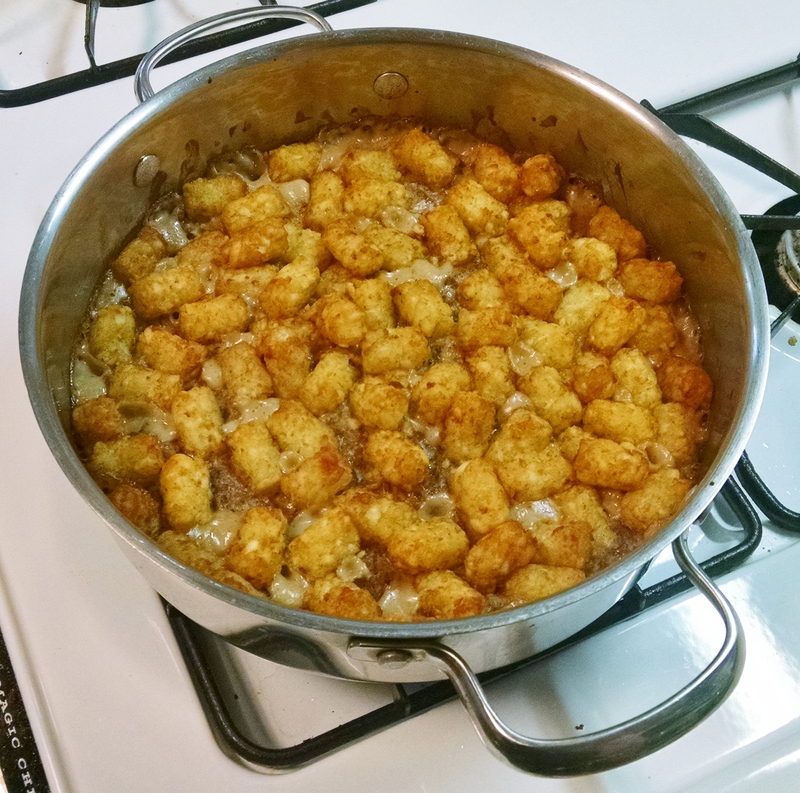 *Bake the casserole for about 30 minutes, or until the sauce is bubbly and the tater tots are golden brown and crispy. *Serve with condiments you would eat on a hamburger, or it’s also quite good plain.